James Gordon Bennett Jr. (May 10, 1841 – May 14, 1918) was publisher of the New York Herald, founded by his father, James Gordon Bennett Sr. (1795–1872), who emigrated from Scotland. He was generally known as Gordon Bennett to distinguish him from his father. Among his many sports-related accomplishments he organized both the first polo match and the first tennis match in the United States, and he personally won the first trans-oceanic yacht race. He sponsored explorers including Henry Morton Stanley's trip to Africa to find David Livingstone, and the ill-fated USS Jeannette attempt on the North Pole. Bennett was born on May 10, 1841, in New York City to James Gordon Bennett Sr. (1795–1872), the founder, editor and publisher of the New York Herald. He was the only son in the family. He grew up mostly in France, and attended the Ecole Polytechnique. In 1861, he returned to the United States, and enlisted in the Union Navy. In 1867, under his father's tutelage, he founded The Evening Telegram, an entertainment and gossip paper that later became the New York World-Telegram. On January 1, 1867, the elder Bennett turned control of the Herald over to him. Bennett raised the paper's profile on the world stage when he provided the financial backing for the 1869 expedition by Henry Morton Stanley into Africa to find David Livingstone in exchange for the Herald having the exclusive account of Stanley's progress. In 1872, he commissioned a Manhattan building design from Arthur D. Gilman, who popularized Second Empire and cast-iron facades. The building still exists, on Nassau Street. Though he sold it in 1889 and it was greatly expanded over the following five years, it continues to be known as The Bennett Building. It was built on a site previously occupied by the Herald's offices and printing plant, and the Herald later moved back into it. In 1890, he commissioned a new Herald building at Sixth and Broadway, completed in 1895. In 1880, Bennett established international editions of his newspaper in Paris and London; their successor is the New York Times' International Edition, previously known as then International Herald-Tribune. In 1883, he partnered with John W. Mackay to found the Commercial Cable Company. It was a successful business and provided an additional large income to Bennett. Bennett, like many of his social class, indulged in the "good life": yachts, opulent private railroad cars, and lavish mansions. He was the youngest Commodore ever of the New York Yacht Club. In 1861, Bennett volunteered his newly built schooner yacht, Henrietta, for the U.S. Revenue Marine Service during the Civil War. At the same time, Bennett was commissioned as a third lieutenant in the Revenue Marine Service (equivalent to an ensign in the U.S. Navy) and assigned to the U.S. Marine Revenue schooner Henrietta (the yacht he had loaned to the U.S. Government) beginning in June 1861. She patrolled Long Island until February 1862 when she was sent to Port Royal, South Carolina. On March 3, 1862, Bennett commanded the Henrietta as part of the fleet which captured Fernandina, Florida. Bennett and the Henrietta returned to civilian life in New York in May 1862. In 1866, on a bet, he won the first trans-oceanic yacht race. The race was between three American yachts, the Vesta (owned by Pierre Lorillard IV), the Fleetwing (owned by George and Frank Osgood) and the Henrietta. Each yachtsman put up $30,000 in the winner-take-all wager. They started off of Sandy Hook, New Jersey, on 11 December 1866 amid high westerly winds and raced to The Needles, the furthest westerly point on the Isle of Wight, famous for its lighthouse. Bennett's Henrietta won with a time of 13 days, 21 hours, 55 minutes. He entertained guests aboard his steam-yacht "Namouna." 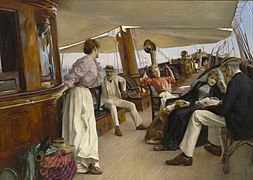 American expatriate artist Julius LeBlanc Stewart painted several works set on the yacht. However, he often scandalized society with his flamboyant and sometimes erratic behavior. In 1877, he left New York for Europe after an incident that ended his engagement to socialite Caroline May. According to various accounts, he arrived late and drunk to a party at the May family mansion, then urinated into a fireplace (some say grand piano) in full view of his hosts. Bennett's controversial reputation has been thought to have inspired, in the United Kingdom, the phrase "Gordon Bennett" as an expression of incredulity. Settling in Paris, he launched the Paris edition of the New York Herald, named The Paris Herald, the forerunner of the International Herald Tribune. He backed George W. De Long's voyage to the North Pole on the USS Jeannette via the Bering Strait. The ill-fated expedition led to the deaths from starvation of DeLong and 19 of his crew, a tragedy that only increased the paper's circulation. He was a co-founder of the Commercial Cable Company, a venture to break the Transatlantic cable monopoly held by Jay Gould. Bennett returned to the United States[when?] and organized the first polo match in the United States at Dickel's Riding Academy at 39th Street and Fifth Avenue in New York City. He would help found the Westchester Polo Club in 1876, the first polo club in America. He established the Gordon Bennett Cup for international yachting and the Gordon Bennett Cup for automobile races. 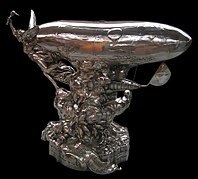 In 1906, he funded the Gordon Bennett Cup in ballooning (Coupe Aéronautique Gordon Bennett), which continues to this day. In 1909, Bennett offered a trophy for the fastest speed on a closed circuit for airplanes. The 1909 race in Rheims, France was won by Glenn Curtiss for two circuits of a 10 km rectangular course at an average speed of 46.5 miles per hour (74.8 km/h). From 1896 to 1914, the champion of Paris, USFSA football (soccer), received a trophy offered by Gordon Bennett. He did not marry until he was 73. 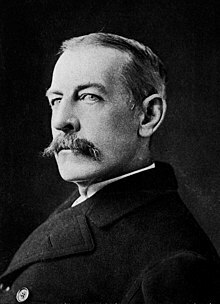 His wife was Maud Potter, widow of George de Reuter, son of Julius Paul Reuter, founder of Reuters news agency. He died on May 14, 1918, in Beaulieu-sur-Mer, Alpes-Maritimes, France. Bennett is buried at the Cimetière de Passy. James Stillman was an intimate friend of James O. Bloss and John William Sterling. After the death of Bennett it was learned by the administrators of his estate that he had appointed Stillman one of the administrators and trustees. Stillman had little or no opportunity to act under the authority of Bennett's will, as he died a few weeks after Bennett's death. Stillman named Sterling one of his executors. Sterling could hardly have begun his duties under Stillman's will when he too died suddenly. The Bennett estate, the Stillman estate and the Sterling estate totaled about $76,000,000. After Sterling's death it was learned that he had appointed his long time intimate companion, Bloss, one of the executors. A few weeks after Sterling's death, Bloss died. Asteroid 305 Gordonia is named after him. He also has a street named for him near Chopin Airport in Warsaw, Poland. The Avenue Gordon Bennett in Paris, on which sits the Stade de Roland Garros site of the French Open, is named after his father. The now ghost town of Bennett, British Columbia and the nearby Bennett Lake were named for him. ^ a b c d e f g "Landmark Preservation Analysis - Bennett Building - James Gordon Bennett, Jr. and The Daily Herald" (PDF). NYC Landmarks Preservation Commission. p. 2. ^ Department of the Navy, Navy Historical Center, "James Gordon Bennett Jr. (1841–1918)"
^ "Three Strange Coincidences - 21 Dec 1918, Sat • Page 2". The Wall Street Journal: 2. 1918. Retrieved 3 January 2018. Hampton Sides (2014). In the Kingdom of Ice: The Grand and Terrible Polar Voyage of the U.S.S. Jeannette. Doubleday.